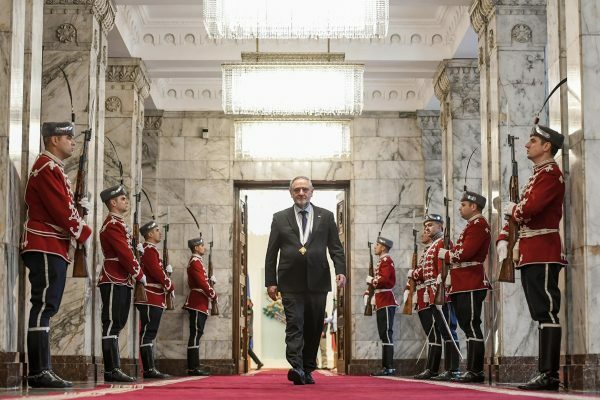 At a ceremony in Sofia on November 22, Bulgaria’s high state honour the Order of the Madara Horseman was conferred on Robert Singer, chief executive and executive vice president of the World Jewish Congress (WJC). The award is given to Bulgarian and foreign citizens who have made an especially significant contribution to the establishment, strengthening and development of bilateral relations with Bulgaria. The honour was conferred in in recognition of the efforts undertaken by WJC to strengthen ties between Bulgaria and the Jewish people. The ceremony took place as part of a broader schedule of diplomatic meetings which included talks with the President Roumen Radev – who formally handed the award to Singer, Prime Minister Boiko Borissov, and Sofia mayor Yordanka Fandukova, during which a number of issues of mutual concern were discussed, the WJC said. A memorandum of understanding was subsequently signed between the Bulgarian Ministry of Defence, WJC and the Organization of Jews in Bulgaria “Shalom” to facilitate co-operation and the exchange of information in the fields of combatting antisemitism and strengthening the security situation for the local Jewish community. Speaking at the award ceremony, Robert Singer said: “There are few countries in the world in which Jews are made to feel as welcome as in Bulgaria. “The bonds of friendship between our two peoples are unshakable. This also finds expression on the bilateral level, where the co-operation between Israel and Bulgaria are expressed in innumerable ways. “Both the World Jewish Congress and myself are especially gratified by the revival of the Jewish community here and actively committed to fostering its continued wellbeing. It is for this reason that the memorandum of understanding signed by the Government, WJC and the local Jewish community is of the utmost importance. “I would like to thank the Bulgarian Government for recognizing the contribution made to bilateral ties on behalf of the World Jewish Congress. May our two peoples only go from strength to strength,” Singer said. Associate Professor Alexander Oscar, president of the Organization of Jews in Bulgaria “Shalom”, WJC’s Bulgarian affiliate, said: “I am both proud and honoured to be the President of the Organization of the Jews in Bulgaria ‘Shalom’ and serve the Jewish people of Bulgaria. “We highly esteem what WJC has been doing to help us fight antisemitism and hate speech and promote tolerance in Bulgarian society,” he said.